While the Celebration Marathon did not go exactly as planned, I still ended up with a 12 minute PR. My race day can easily be summed up with a single screen shot. Going into this race, I felt pretty confident in my training. I knew that later into some of my longer runs, the pace dropped off. My expectation was a combination of the totality of my training, being tapered, and the extra boost that always comes with running would get me to my goal. I would also be running with a pacer and took a pace that was not too aggressive. For the first half, things felt great. I stuck with the 4:40 pacer and the miles ticked off right on pace. Shortly after the halfway point was when things started to go downhill fast. Around mile 8 or 9, I started to feel like I'd need a potty stop at some point soon. The course is 2 loops, so my thought was to hold off till after the half marathon splits off so I wouldn't have to wait too long. I should have stopped at mile 12, because the next stop wasn't until right around mile 14. After crossing the half marathon mat, I started to have to take walk breaks for fear of an accident. Just after mile 14, I was able to stop and I hoped I'd be able to get back on track and maybe even catch up to the 4:40 group. Unfortunately, that would not be the case. Over the next couple of miles, I started to experience back pain which slowed my pace down to the mid 12's. 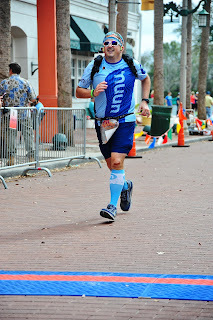 By mile 18, I was finding it hard to run. The next couple of miles had motivational signs every 100 feet or so. I was at least able to motivate myself to run between every other sign and at times every 2 signs. Miles 21-23 were more walking then anything. By the checkpoint at mile 22.5, my average pace had dropped from 10:40 at the half marathon mat to 12:22 After the checkpoint, I was starting to feel a little better. I decided I would push myself over the last 5k. It wasn't fast, but my last 3 miles were 2-3 minutes per mile faster then the previous miles. I crossed the finish line in 5:39:34. I really wasn't sure if I should be happy or sad. My race didn't go as planned, but at least I finished, and I finished with a 12 minute PR. I've taken a few lessons from this race that I plan to use to my advantage in future races. First, I know I need to work on my functional strength and mobility. This includes core strength, hip strength, and hip mobility. Second, I need to work on running on tired legs. The next marathon I train for will include long runs with tempo efforts later in the run. Finally, I need to rework my nutrition. In the later parts of the run, I ended up taking in no calories. My stomach was so sour. I want to focus on using less gels. I believe I can take them less often then I have in the past, and I'd like to move to more solid foods. If I can accomplish all these things, I know my next race will be even better. Now it's on to tri training.